CEOL | Learn how Admins can install CloudExtend Apps for multiple users at once. Microsoft offers a convenient way to install add-ins for multiple users at once. This is also ideal for companies that globally block access to the Office store but need to make exceptions for certain users and/or apps. 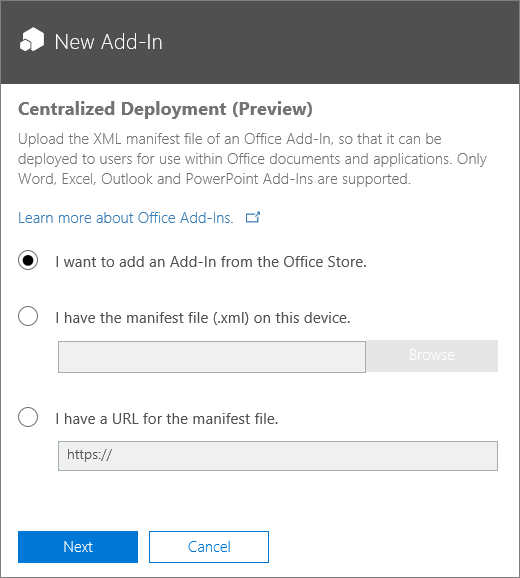 Microsoft has an article here that describes how your Administrator can deploy specific Apps from the store to one or more end users while still preventing access to the store for all users. The screenshot below is from that article. Once your Admin reaches this step they just need to select the 1st option (I want to add an Add-In from the Office Store) and follow the steps to make our Add-In available to one or more users.